Welcome to July! 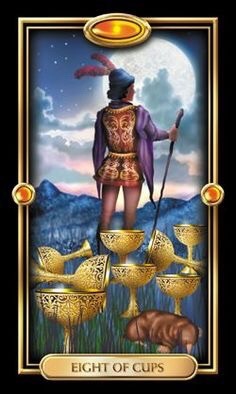 The Page of Cups certainly feels like a great card to begin such an important month. This Page is, of course, a Messenger, and naturally signifies a beginning for you. In this particular instance, I truly feel it is the beginning of a month of Divine creativity. Finally, things begin to mesh in your world, if indeed they are meant to fit. As I stated yesterday, there are no coincidences here. Follow your intuition, and pay close attention to your dreams, as Neptune continues its retrograde. There is so much you can accomplish this month; you need only be receptive to the creative inspiration available to you through the Universe. You may ask what type of beginning awaits you, and I would be inclined to answer the type which allows you to figure things out for your journey. This entry was posted in Card of the Day, General Tarot, Love and Finance, Patreon, Readings, YouTube Videos and tagged Card of the Day, Guidance, Page of Cups, Path, Reading, Tarot. July gives birth to fresh ideas, fueled by the determination to succeed. You are learning to trust your intuition more all of the time and manage to surround yourself with more of the right people as well, which is very important. The potential for change is great, even if it does’nt all come about this month. You are feeling more in control of your direction, and everything is now more black and white to you; you have eliminated the gray areas, and are working creatively to make new inroads. Time is the most important thing we’ve been given, and you are aware that it is not possible to return to your youth, so you must make great use of every precious moment. The month is filled with positive events which fill you with excitement and spur you on to victory. You are still busy working on that list, and are leaving no stone unturned. This is one part of life which requires very close attention to detail. Even though the Karma bus is enroute to Happinessland, it is wise to occasionally take a time out to just chill. If you hit a snag with a particular issue, look at it with a different approach for handling; you may need to separate from the entire idea to reach your goal. July is filled with achievements, no matter how large or small, and you will know that you will be in your power by October. Your wish to break free does not appear to come this month. In spite of all of your progress, you may feel that you can not overcome the obstacles to your goals and find the necessary solutions. You are finding them, but do not spend all of your time dwelling on worries which are all mostly in your mind. You will conjure up the clarity to rise to any and all challenges before you. Aries, sometimes dark clouds truly have silver linings. In reference to a betrayal in your midst, it would appear that someone has been pulling the wool over your eyes, or have they? The mind is a tricky thing, but if you can close the door on these thoughts, your mood may once again be joyous. A change in direction is necessary, and it is helpful if you can overcome a particular situation which is holding you back and causing you stress. Breaking free from it this month appears to be your main priority. Some days, you are just not sure, Taurus, if you can remain patient until things begin going your way. You will make it, but it may not really be evident until the time of the Equinox, and then you find yourself moving on after that. Keep saving your money, for you will need it when the time comes to truly pursue your hopes and dreams. You have positive moments coming this month, but the doors do not appear to be opening for you until after August. You will be excited at the prospect of new beginnings. Gemini, you may need a break from relationship issues in July. It is almost as if you prefer to not acknowledge their existence. This can be any type of relationship. Take the time to ground yourself and focus on creative ways to conjure up some positive change in your life. There has been a great deal of stress surrounding you and it is quite the feat to at least seem to have overcome some of it. Truth be told, those worries do not go away, no matter how hard you have worked at creating a secure environment for yourself. July is a month of crossroads for you, Cancer; you desire less stress in your life and are ready to plow through anything to make that happen. There are many interactions with others taking place; remain grounded and do not wear your heart on your sleeve. This is all part of the new beginnings you seek. The road to true fulfillment needs to be faced and finally dealt with; it has been put off long enough. This is a month you will long remember, Leo. Nothing can stop you now; by the time the Sun reaches your sign, and the first of two New Moons in Leo occurs, you are breaking out and heading for the hills! There is an adventure which awaits you and the changes you desire for true happiness can be yours. No hoping and praying here as you are winning right and left with more success than you have seen in a very long time. Virgo, your future is playing out right in front of your eyes this month. You will know that new beginnings are on their way and the Universe has every intention to provide exactly what you need. Balance needs to be achieved now and through a loss can come tremendous gain; you will see smooth sailing by the Full Moon in September. The future is beckoning you in July, Libra, and you are excited over the prospect of turning your back on the past. Your focus is turning toward a more grounded life, for which you will soon be able to give thanks. Should you encounter any resistance to your agenda, ignore it; what others think of you is none of your concern. You have issues going back to when Saturn was in your sign, and you really need to break free. Scorpio, you are still looking for that door to abundance to open; it will probably happen for you closer to the New Moon in Leo on the 23rd. This is a really good New Moon for you which should bring forth some drastic changes which will help alleviate stress. Consider what it is that you truly want, and take advantage of the Divine Inspiration coming your way. You are removing yourself from things which do not serve your soul and are feeling stronger and knowing you have definitely survived. By now, Sagittarius, it would appear that, Saturn, which is currently retrograde in your sign, has you saying “When will you leave me alone?”. The answer is by Christmas, but for the moment, you need not focus on the disappointments which Saturn has created, rather on your accomplishments. Things happen in phases and there are good days as well as not so good ones. Rejoice in the positive and do not overthink the negative. Capricorn, applying some serious focus to your work and your financial situation can produce excellent results for you. Keeping your nose to the grindstone definitely has its benefits. You appear to be harnessing all that Jupiter, giver of gifts and good luck has to offer, but know that true rewards come from the lessons which Saturn brings. The clarity you seek is not quite here, but your temptations are the only thing which can get in your way. 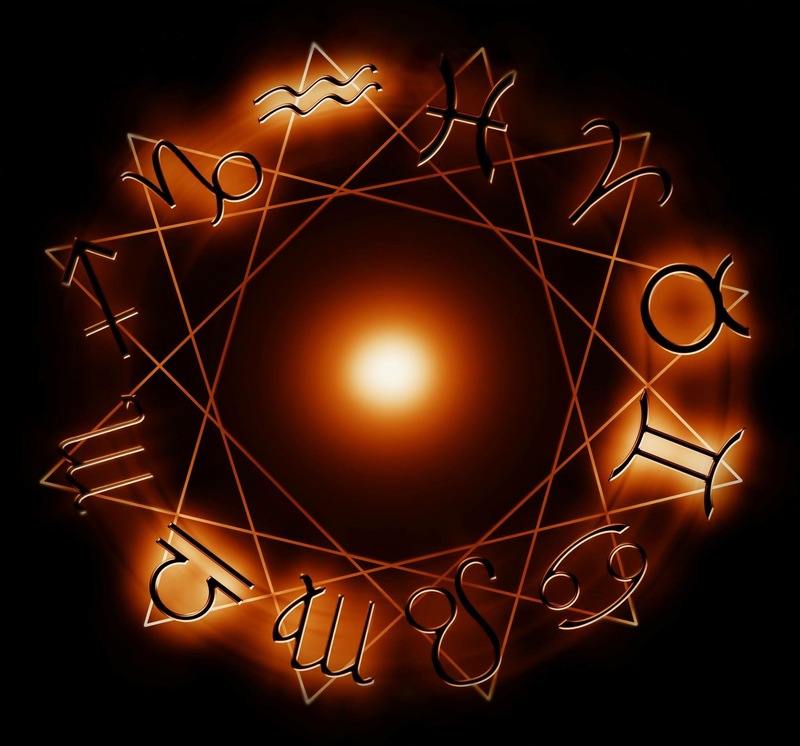 You may find yourself tossing some ideas around in July, Aquarius, as you may not be 100% certain exactly what you want, or how to go about getting it. Keep in mind that by the 23rd, eclipse season will begin and that next month, you will host a lunar eclipse in your sign. So, if you remain on the fence and undecided what to do, know that the Universe is going to bring change your way, ready or not. Pisces, what in your life serves to remind you of the hard times? This is where your plans need to be formulated, so that you can truly move forward toward a much less stressful existence. Do not place too much emphasis on worrying about whether the abundance you desire can be achieved. Allow yourself to proceed in a direction that opens you up to the blessings of the Universe before you know it. This entry was posted in Astro-Tarot, Full Moon, General Tarot, Love and Finance, New Moon, Patreon, Readings, YouTube Videos and tagged Astro, Tarot. Connection, balance, blending, innovation, unity. 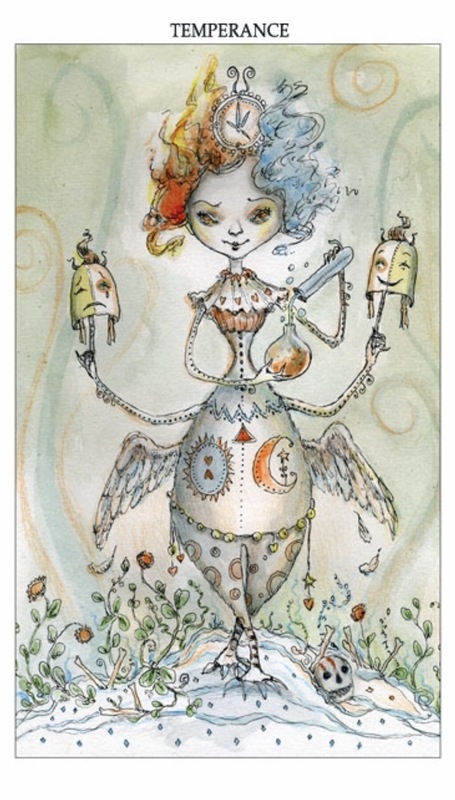 Lady Temperance blends hot and cold, sun and moon, light and dark — combining the unconscious and conscious into a flourishing balance. An alchemist, she achieves equilibrium and guides cooperation by combining forces. Moderator between the outside-world and inner-world, she carries masks of happiness and sadness, and her hair is a perfect balance of fire and water. The resolution of conflict requires compromise and cooperation. The combination of opposites makes for the ideal mixture, and increases your ability to adapt to change. The blending of shadow and light, realism and fantasy, joy and melancholy, all hold a natural synergy, keeping spirit and mind in a place of essential balance. Being uncooperative. Disharmony. Bad combinations. 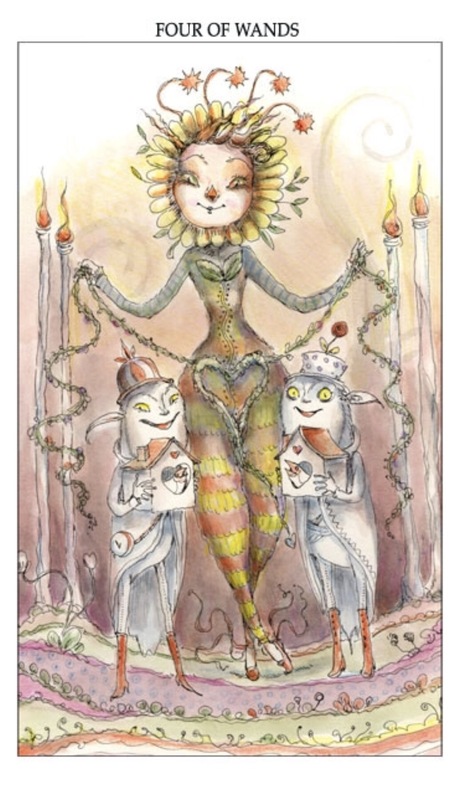 This entry was posted in Artist, Deck Review, Featured Card of the Day, General Tarot, Readings and tagged Joie de Vivre, Paulina Cassidy, Tarot, Temperance. I do not believe in coincidence, and given the fact that we are closing out June with the Devil, after having had him also close out May, you would appear to be ready. How long has it been now that you have been trying to set yourself free from his shackles? One of the interesting things about this card, is that we often forget we have free will, and succumb to temptation far too easily. The time has come to accept the blame for your actions and begin the process of setting yourself free. If you are quitting something cold-turkey, more power to you, but it would appear that your mindset is in a much better place than it was a month ago. This should allow you to begin July feeling less encumbered by situations which have held you prisoner for far too long. Vitality, growth, celebration, partnership, stability. Beltane and her loyal friends Razzle and Dazzle partake in a celebratory ceremony. They’re filled to the brim with enthusiasm and the simple joy of being alive. In the energetic spirit of togetherness, they prosper in the rewards of past ventures. Beltane holds a garland into the shape of a heart. In a blessing of the homestead, Razzle and Dazzle hold birdhouses. You’ve worked hard, and it’s time to celebrate and enjoy the fruits of your labor! Relax for awhile and enjoy the company of friends and family. Follow a triumph of achievements with the continual building of your future; this will help put things in motion for intended goals to be realized. Shaky relationships. Lack of pleasure. Exclusivity and snobbery. 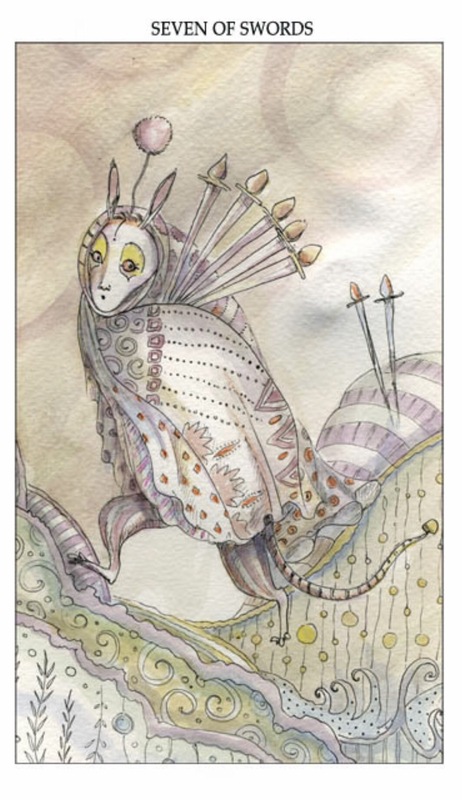 This entry was posted in Artist, Deck Review, Featured Card of the Day, General Tarot, Readings and tagged 4 of Wands, Joie de Vivre Tarot, Paulina Cassidy, Tarot. There must be so much more out there that you have yet to experience. 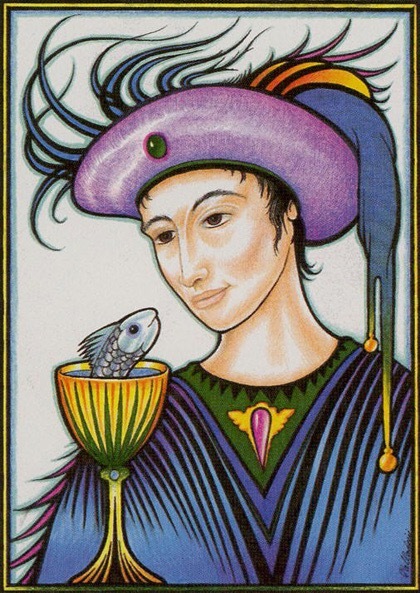 The 8 of Cups is a card of moving on, and often leaving behind a great deal of nonsense. What you are turning your back on may have been wonderful at one time, but it is likely it has outlived its purpose and is not part of the new identity you seek. A new chapter is on the horizon; it is perfectly ok to accept it. Wrap up old projects and put them to bed and be prepared to discover what lies ahead for you on your journey. Caution, impulsiveness, irrational, dishonesty, diplomacy. Running across the land with a bundle of stolen swords in his arms, Tom Foolery darts away with five stolen swords. He’s creating upheaval just for the sake of it. He’ll soon have to come to terms that he’s getting himself into a mess that won’t be worth dealing with. When you feel your life is out of control, the rebelliousness within tends to pop up out of nowhere. You may be overtaken with a sense that your actions don’t seem to make any difference, even though they do make a difference. You may want to run away in avoidance of a situation, but running away could make the circumstance worse. It’s a time to look inward and examine your own behavior toward yourself and others. Exercise caution, and identify your true allies. Take time to inspect those you work with, and use diplomacy and honesty when dealing with others. Assuming a victim mentality. Fear of responsibility. Reluctance to complete what’s been started. 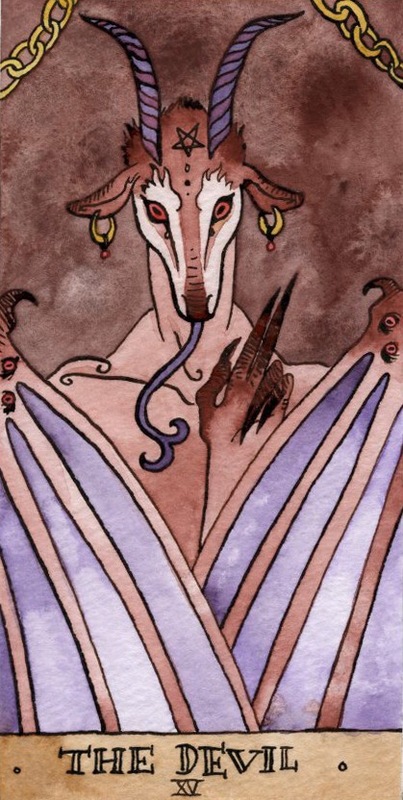 This entry was posted in Artist, Deck Review, Featured Card of the Day, General Tarot, Readings and tagged 7 of Swords, Joie de Vivre Tarot, Paulina Cassidy, Tarot.